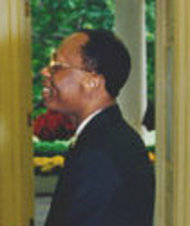 Jean-Bertrand Aristide, ki fèt 15 jiyè 1953 se yon politisyen ayisyen epi li te Pè katolik, li te prezidan Ayiti nan lane 1991, 1994-1996 epi 2001-2004. Yon rebelyon fè li kite peyi Dayiti. Aristide te fet nan Pòt Salu, Ayiti. Li te edike nan lekòl Salisyen yo nan Pòtoprens ak Collège Notre-Dame, gradye lane 1974 avèk onè. (avèk Laura Flynn) Eyes of the Heart: Seeking a Path for the Poor in the Age of Globalization, Common Courage Press, 2000. Dignity, University of Virginia Press, 1996; tradui (fr) Dignité, Éditions du Seuil, 1994. (fr) Tout homme est un homme, Éditions du Seuil, 1992. (fr) Théologie et politique, Edisyon du CIDIHCA, 1992. (avèk Amy Wilentz) In the Parish of the Poor: Writings from Haiti, Orbis Books, 1990. Paj sa edite a 16:20, 30 mas 2019.